Turmeric is quickly becoming a popular ingredient in health supplements. Part of that is because of its high antioxidant content, which enables it to be effective against many different medical conditions, from immune deficiencies to mental disorders. When we wrote this Puritan’s Pride Turmeric Curcumin review, we wanted to see if it held up to industry standards. The first ingredient listed is the one from which this product gets its name: Turmeric. 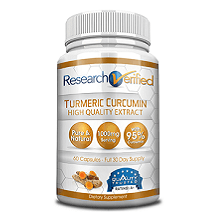 This substance is normally found in the Curcuma longa plant and is considered to be a massive wealth of antioxidants. That’s one reason that it is so prominent in natural health supplements; it can be used to treat a wide variety of conditions. These include arthritis, Crohn’s disease, Irritable Bowel Syndrome, depression, anxiety, and insomnia. Bioperine is used to increase the body’s bioavailability. This means that, without it, your body can’t process the turmeric, nor use it to its best ability. The recommended dosage for this supplement is one capsule one or twice a day. It should preferably be taken with food. You can also open the capsule up and prepare it as a tea. It is not clear under what circumstances you would take this supplement once a day, and when twice a day. There were no possible side effects listed on the website, nor any health warnings at all. However, there are a few things to consider when taking a turmeric supplement of any kind. If you have had experience with gallstones or blocked bile ducts in the past, you should probably consult a doctor before using these kinds of supplements. Because turmeric can increase platelets, you should also inform your physician that you’re taking a supplement before any surgery as it increases your chances of excessive bleeding. Pregnant and breastfeeding women, as well as children, should take caution too. You can buy this product online through the Puritan’s Pride website. 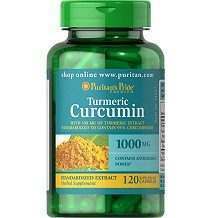 The average price for a bottle of Puritan’s Pride Turmeric Curcumin is $28.99. This will buy a bottle of sixty capsules. However, at the time being, there are two sales prices that you can choose from. The standard one will reduce the price by 50%, dropping the price down to $14.49 per bottle. The second saves you 60%, but you must purchase five bottles for $57.95. That comes to about $11.59 per bottle. Puritan’s Pride Turmeric Curcumin does, indeed, have a money-back guarantee. You have a full year from the date of buying the product to return it for a refund. The guarantee states that you will be refunded for the unused portion, but it is not clear exactly how that is worked out. The ingredients list for this product is solid. Not only does it contain the turmeric that it claims to, but it also contains the additive necessary to reap the benefits of it. It also has a 100% money-back guarantee, as well as a decent sales price. However, the dosage is not clear as to when you should take one capsule a day and when two. Even worse, side effects are not mentioned. Because this is a product that could lead to excessive bleeding in the wrong hands, this is definitely a safety issue.